There are still no arrests to report in the Pompano Beach Snowbird Murders. 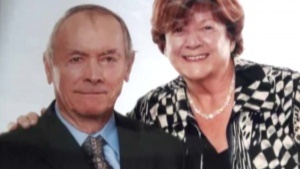 The Canadian couple, Marc and Rita Gagne, were found dead in their Golf View Estates mobile home seven day ago. BSO continues to offer little info about any suspects, motive or even the cause of death. The Quebec couple’s deaths is being treated as double homicide by the Broward County Sheriff’s Department. BSO has released few details about the case that has shocked neighbors in the over-55 community. The Sun-Sentinel reports that days after double murder,”fear still lingers” among the residents of the Golf View estates Mobile Home Park. The park is located right near Atlantic Boulevard and the Florida Turnpike in the western part of Pompano Beach. Earlier this week, over 150 residents of the mobile home community ” marched through the community” according to a CBS 4 report. The neighbors expressed their concerns about the murders and the overall safety in the community. They called for increased security during their protest. “There is zero reason to believe anyone would have targeted them,” their nephew told NBC 6. BSO has not shared any information on possible motive for the killings or offered clues on potential suspects. The coroner’s report has not been issued publicly and there is still no official word on cause of death. Pompano Beach pit bull attack raises concerns & unanswered questions.